The best way to get to know a community is by scheduling a tour. See the facilities, meet the staff and residents, and get a feel first hand what it's like to live at Copper Creek Cottages Memory Care. 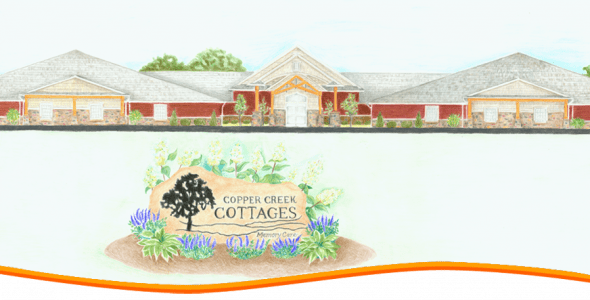 Opening in the spring of 2016, Copper Creek Cottages is a specialized memory care community that provides a safe, secure, and comfortable environment to our residents and your loved ones. Our facility is beautifully built and is a warm and home like environment. Our community features 30 apartments that are spacious and designed for senior living. Copper Creek Cottages Memory Care provides specialized memory care in a safe and nurturing environment. We recognize every individual’s physical, mental and social needs and provide a secure environment that fosters independence for as long as possible. Here at Copper Creek Cottages Memory Care we offer one bedroom and two bedroom apartments that has its own senior friendly in suite bathroom. The rooms are luxurious and is a haven of independence, comfort, safety and privacy which is greatly valued in our community. Residents enjoy walking and stretching their muscles on our astonishing courtyards that are secured and gated to ensure the safety of your loved ones and residents. Delicious meals are served three times a day on our grandiose dining area where residents eat and dine together. Our community create activities based on resident’s likes and dislikes to keep them active and engage. These activities are stimulating and beneficial to our residents. We have spiritual activities, supervised outings, art classes that residents enjoy. Residents and their families gets the peace of mind they deserved here at Copper Creek Cottages Memory Care. Our staff are available 24 hours a day to ensure we provide care and assistance whenever they need it. We also installed emergency call system on each room to make sure we would be there when residents need us. Here at Copper Creek Cottages Memory Care your loved ones will be greeted everyday with courage and wellness. Get the peace of mind you need to continue life as it is while your loved ones get the best care and assistance.